SPRING is engaging in a unique partnership to move social and behavior change communication (SBCC) to the top of the nutrition agenda. Recognizing the need for concerted action to increase nutrition impacts through at-scale SBCC programs, SPRING partnered with the Global Alliance for Improved Nutrition (GAIN) to convene a gathering of global SBCC thought leaders from across public and private sectors to develop a strategic research and implementation agenda and action plan for accelerated nutrition gains through better SBCC programs. USAID’s Bureau for Global Health called on SPRING to join forces with GAIN to convene an Expert Working Group of diverse SBCC thought leaders from nutrition, health, WASH, and HIV, and private sector marketing, to identify priority focus areas for getting to more and better nutrition SBCC. 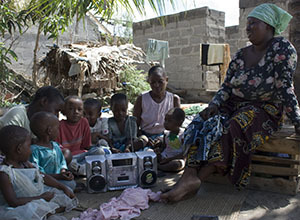 This process was informed by a summary of recent evidence reviews for established and promising nutrition SBCC approaches and practices, including SPRING’s literature review, Evidence of Effective Approaches to Social and Behavior Change Communication for Preventing and Reducing Stunting and Anemia. This conference built upon one of the key themes that emerged from the year-long work of a working group of SBCC experts: doing great SBCC for nutrition with an at-scale mindset. This included considering scale from the initial planning and design phase, engaging local systems meaningfully, and creatively partnering across disciplines and sectors to maximize impact. The resources below include background materials used to inform the conference agenda as well as presentations from both days of the event. Please note that many presentations included multimedia not available here. More information about GAIN's Maternal, Infant, and Young Child Nutrition work can be found here.